Less than 10 percent of FAU’s 28,000 students voted for student body president this year despite Student Government’s efforts to promote the election. Student Government has control of almost $8.6 million of students’ money, yet only 8.2 percent of students (2,317) voted for the people who decide how it’s spent. So why aren’t more students voting? Do they even know elections are happening? Long gone are the days of paper ballots. February’s online election via Owl Central was promoted by SG members tabling across each campus, giving out free food and swag. But that still wasn’t enough to convince more than a couple thousand students to vote. Although, this year’s election saw double the number of students vote. Only 1,226 voted in the spring 2017 election, which means SG is at least on its way to improving voter turnout. Craig Agranoff, an FAU adjunct instructor of Advanced Campaigning, said he’s observed five SG presidential cycles and is always shocked at the lack of student participation in elections. 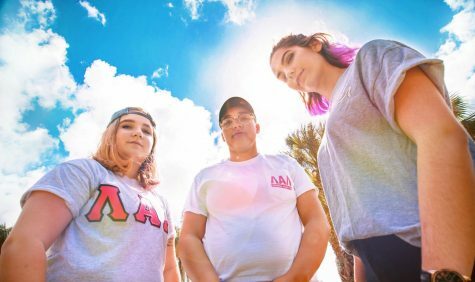 “I don’t know what they need to motivate them but the FAU Student Government elections are a perfect example of how you can make it the easiest thing in the world, and yet, [students] still just don’t care,” said Agranoff. But voter apathy and lack of awareness go far beyond FAU’s elections. They plague other universities as well. 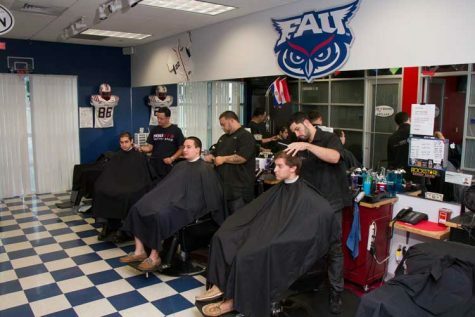 When it comes to campaigning for an election, FAU students must comply to a strict set of rules when advertising their candidacy. 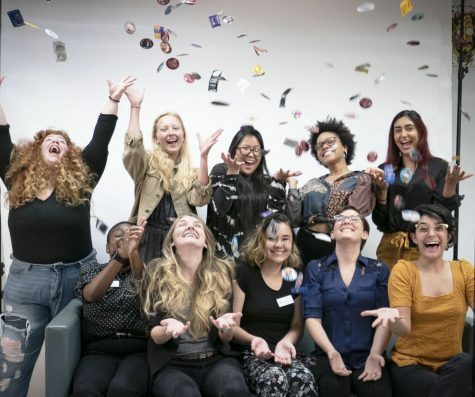 During the two-week campaign period, candidates must adhere to requirements detailing how large posters can be, what the posters can say, and even how they can campaign via social media. 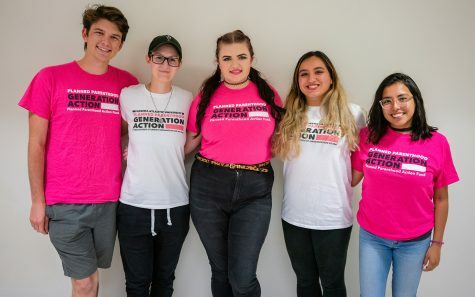 Campaign materials like flyers and posters can’t be posted in on-campus dorms, libraries, classrooms, or computer labs — basically, anywhere students heavily populate. This might explain why many students consistently have no idea elections are happening. And in Boca Raton, students are going to school in the center of a business district, three miles from the beach, and 45 minutes from downtown Miami. According to Agranoff, these distractions play a large role in the overall engagement of students (aware or not) and their willingness to participate in campus events. 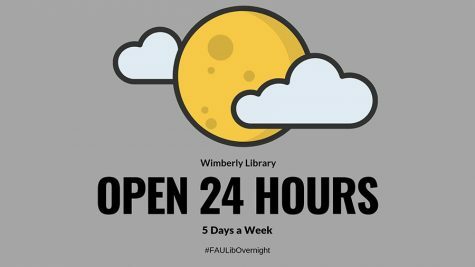 FAU is home to more than 4,000 students living on campus, which leaves 24,000 commuters who only frequent the campus for several hours at a time before driving home. Commuter student and senior communication major Dana Saulter said she had few reasons to visit the campus outside of attending class. Campus culture, geography, and housing have a significant impact on the ability to get the attention of students as well as their school pride. Consider the University of Florida (see table below), where freshmen are required to live on campus — without a car — in Gainesville, a college town. Nearly 20 percent of UF students voted in their spring election. The April 24-25 special election takes place a day after classes end. 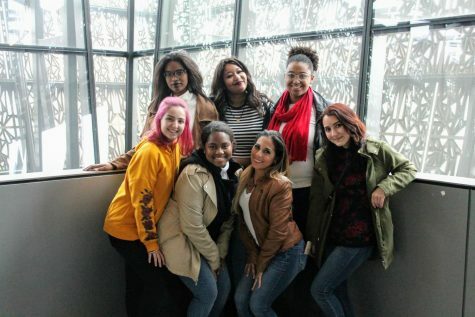 And based on the February election’s voter turnout and with finals in full swing, there may be an even smaller number of students showing up to the polls this time around. Some students are preparing for graduation as well, like SG elections supervisor Doug Speed. The graduating senior organized the original election and is now responsible for overseeing the special election. 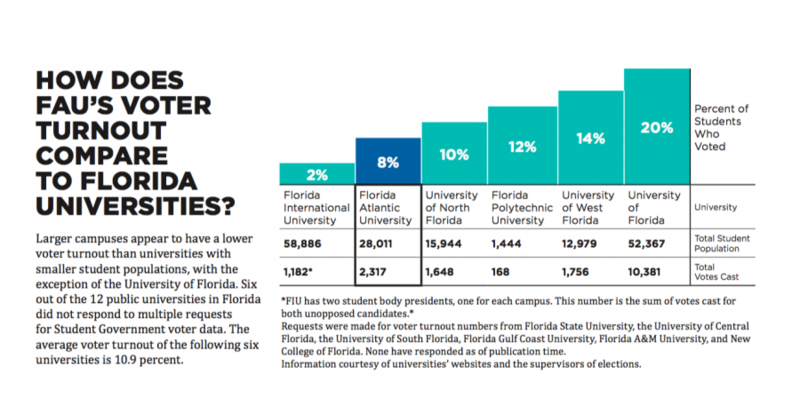 How does FAU’s voter turnout compare to Florida universities? Larger campuses appear to have a lower voter turnout than universities with smaller student populations, with the exception of the University of Florida. Six out of the 12 public universities in Florida did not respond to multiple requests for Student Government voter data. The average voter turnout of the following six universities is 10.9 percent. *FIU has two student body presidents, one for each campus. This number is the sum of votes cast for both unopposed candidates. Requests were made for voter turnout numbers from Florida State University, the University of Central Florida, the University of South Florida, Florida Gulf Coast University, Florida A&M University, and New College of Florida. None have responded as of publication time. Information courtesy of universities’ websites and the supervisors of elections. Katrina Scales is the managing editor of the University Press. For information regarding this or other stories, email [email protected].